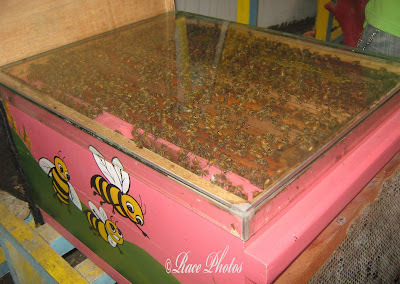 This is the first time that Josh see a real group of live honey bees and his feelings are mixed. 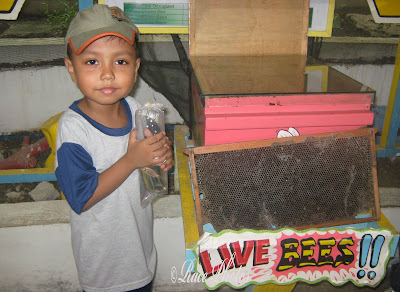 He's excited to see them all together in one box and wondering how they form or produce honey. At the same time he's a little afraid that they might come out from the box lol! I kept a close watch on his hand though he's got a fish on hold. Why?Because he's asking me what would happen if he opens the box :-). He's a little afraid but very curious about them too! Anyway seeing honey bees live made my story telling to him easier as when I'll tell a story about him he'll know what I'm talking about! Btw this is a shot from BioResearch on their educational tour. blogwalking and popping by to say hi! Brave little guy; to be standing so close to them. Oh my gosh! Bees freak me out!